Capcom's Resident Evil (AKA Biohazard in Japan) was not the first "survival horror" game, but it was undoubtedly the most influential in this very particular sub-genre of the adventure game. Creator Shinji Mikami's seminal title was originally released in 1996 for the Sony PlayStation, then completely remade in 2002 for the Nintendo GameCube. The latter was my late introduction to the series. In the "video games as art" debate, it is oft argued that what invalidates games as art is the element of interactivity. While games may certainly contain art in the visual and audio components, the core experience is one that differs crucially from novels or films in that the audience is allowed and encouraged to affect the outcome, thereby potentially undermining and devaluing any authorial direction. The point is usually followed with further unending discussion on what exactly constitutes art, but Shinji Mikami, in creating Resident Evil, may have arrived at a design that broke down that perceived barrier between interactive media and artistic intent. Whereas many other game designers would endeavor to push the medium forward by pursuing boundless freedoms for the player to do unimaginable things, Mikami perhaps realized that authorial intent could only be achieved by imposing limitations on the game experience. Only in that way could the artist retain control in the dynamic with the audience. With Resident Evil, he attempted to control, not only exactly how the player played and progressed through his game, but even how they felt at any given moment. He imposed his vision by encumbering players with highly restrictive controls, fixed cinematic camera angles, and exploration-based gameplay that was actually very forcefully directed. Resident Evil's tank-like character-relative controls have remained a consistent hallmark of the series, and they have also been criticized since the very first game. Although the zombies that made up the bulk of the game's threats were themselves slow-moving, in tight quarters they became tricky to dodge, largely on account of the awkward and sluggish controls. The unintuitive movement was meant partially to induce the panic that one would actually feel when confronted by a zombie in a narrow corridor. But it also led to a lot of running into walls even when no enemies were present. I can't imagine that that sort of slapstick display was part of the artistic vision behind the design. Five installments later, it was second nature to me, but even I couldn't argue that it was perfect. There was actually a more practical defense for the character-relative controls, however, as they allowed the player to preserve proper character orientation, even as the camera constantly and instantaneously cut to different angles. 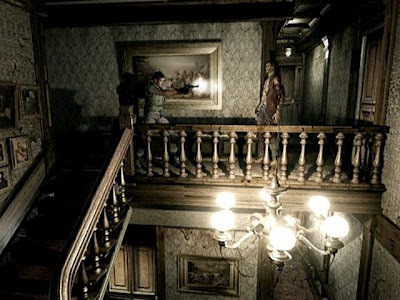 The other consistently controversial aspect of the original Resident Evil design, the fixed cameras were often positioned at the least helpful angles, leaving the player to fire at or flee enemies that would not even be visible in the frame. On a technical level, fixed angles were unavoidable due to the game's reliance on pre-rendered backgrounds. But it was also an artistic design choice to maintain control over the player's experience by forcing them to see exactly what the artists wanted them to see at any given spot. Since this was a horror game, the objective was to induce fear. One way to achieve this was via blind angles that left players dreading whatever lay beyond their vision. In a broader way, as with the unintuitive controls, it was meant to take the player out of their comfort zone, which would certainly have been the point. And because enemy placements were also fixed and finite, the designers could ensure that it was never more than the player could handle. 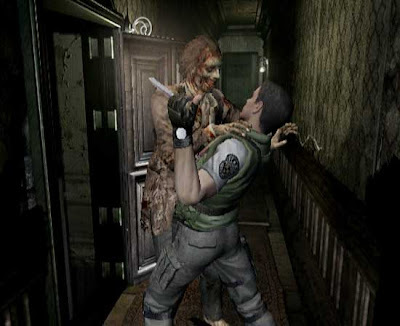 As Capcom's marketing term suggested, Resident Evil was as much about survival as horror, and limited resources encouraged the player to play as conservatively as possible. As series veterans would always warn, there was insufficient ammo in the game to kill every enemy. Indeed, that was why it was worth trying to dodge those zombies whenever possible, and why it became so terrifying when the controls made getting through those hallways that much more harrowing. Furthermore, the equally limited supply of healing items meant you could not afford to take hits needlessly. This was all part of the meticulous design, however, as these elements combined to force the player into these delicate close encounters with zombies that would otherwise have been nothing, had either ammo been more plentiful or character movement more effortless. Even the player's ability to save the game was restricted by a finite supply of ink ribbons that were needed to record data at the typewriter save points. Worse still, weapons, ammo, healing herbs, and ink ribbons all had to share very limited inventory space with necessary key items. You were to take only what was absolutely necessary, leaving the rest in the magically interconnected item boxes. Since combat was clunky and best avoided if at all possible, much of the actual gameplay came down to puzzles. There were the real adventure-style logic puzzles that had to be solved by collecting and interpreting clues. Then there were the simple lock-and-key devices that were not puzzles at all, but thinly veiled routing mechanisms to impose a strict sequence to the exploration. Some critics deride these obstacles as infantile, but the point was not to test your brain in presenting you with a "shield emblem" that just so happened to seem like a perfect fit for that shield-shaped slot on the locked door that you passed by earlier. Rather like the Metroid games, in initially barring you entry there and forcing you to head elsewhere in search of the key, the game was controlling where you would be at any given point, even though the nonlinear 3-D environment presented the illusion of freedom. Once you found the key, you were expected to know what to do with it, and that knowledge would guide you back to where you needed to be. Of course, the game knew as well where you would be heading, and it would take advantage of that to lay traps for you, occasionally even in places that you had already passed through uneventfully. Perhaps you would enter into a familiar corridor thinking it was safe, only to be surprised midway through, when zombie dogs would come crashing through the windows. Those are the moments that every Resident Evil player remembers, and just about every player remembers them the same way. Truly, that was the meticulous and manipulative Resident Evil design at its very best. The narrative was a simple one of survival and escape, made extraordinarily effective because the experience immersed the player in the hopeless situation and left them helplessly empathizing with the characters. There was very little actual plot in the game, and what was there was on a par with a B-movie script. The real story was dispensed primarily through documents strewn all about the mansion. These provided context and explained what all went down that led to the nightmare. Included in just about every Resident Evil would be a researcher's diary, which invariably played out the same way. Some witless, conscienceless cog would start out complaining about his job or perhaps an annoying co-worker, then, as the player flipped through the entries, the text would become progressively more deranged as the infected writer descended into a state of cannibalistic undead. As with all approaches, this sort of nontraditional storytelling had its advantages and disadvantages. Perhaps its effectiveness came through best with the Lisa Trevor subplot that was added for the GameCube remake. Even among all the other horrors that populated the mansion, Lisa was a uniquely hideous and undying monster that arrived with no exposition to suddenly stalk the player at a point midway into the game. In that instant, your only concern would be fleeing for your life. But given a moment's respite, you might have wondered what the hell that freak show's deal was. She could not tell you her story herself--that would have been truly horrible--and none of the other characters, for whom this was life-or-death and not just a game, had reason to care. But the information was there in the game, waiting as stray documents to be discovered by the player during moments of peaceful investigation, so as not to wreck the narrative sense. Learning these details would not alter the events of the story (why would it? ), but they could inform and enhance the player's appreciation of the fiction. I would compare it against the various approaches tried by the Metal Gear Solid series to flesh out enemy characters. The Resident Evil way did not require characters to break out of the moment unnaturally to bug the player with sob stories that weren't truly pertinent. No, Resident Evil was not entirely successful in all of its risky decisions. It could try to manipulate players into experiencing it a particular way, but it obviously couldn't force them to endure if they weren't having it. 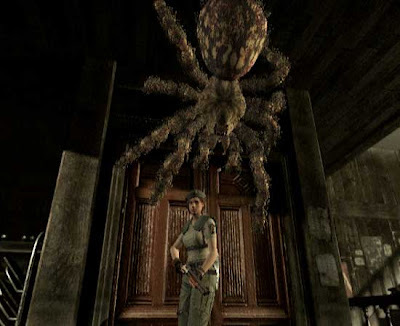 Although, as survival horror, it was supposed to be an uncomfortable experience, being that it was a game, which could still be won or lost, the seemingly deliberately poor gameplay could become overwhelming if the player struggled too long to adapt to the admittedly unintuitive design. It sat on the razor's edge between inducing fear and merely frustrating, and a player who too often fell on the wrong side of that might be justifiably encouraged to walk away. While I like to keep an open mind, I too have limits to what I can endure, and, believe me, I've come up against games that, though interesting, crossed that line and forced me to turn away. But to complain about the very deliberate design choices of Resident Evil would be akin to criticizing a film over personal objections to a character's behavior, even though it may be perfectly consistent with that character's personality and history. The movie quite possibly even intended to elicit such a response, in which case it should be considered a success, insofar as it achieved what it set out to accomplish. Given how popular the series remains, the game obviously clicked with a good many players, but its detractors often miss the point in telling Mikami how his game is supposed to play, when he surely knows far better what he was going for. It comes back to the key difference with video games, in that, because of the interactivity, the player does expect to claim a creative role in the experience. In a way, it is perhaps the game fans themselves who refuse to take game creators as artists. As everyone surely knows, the GameCube Resident Evil was a remake, the original having been released six years earlier for the Sony PlayStation. That release was followed a year later by Resident Evil: Director's Cut for the PS1. It added an "arranged" mode that apparently featured some different camera angles and also changed up item and enemy placements. In 1998, a yet newer edition, the DualShock Version, added support for Sony's DualShock controller, also replacing the in-game music in what was otherwise a reissue of the Director's Cut. The Director's Cut editions also restored the auto-aiming that had always been a part of the Japanese release but had been foolishly removed from the first English edition. I couldn't imagine getting through the game without this feature. Playing the GameCube version, it had quickly become automatic for me, every time I turned a corner, to press the aim button to see if my character could lock on to something that I couldn't see. Although I remain curious about the early editions, I haven't had the time yet to go back and try them. I did, however, play Resident Evil: Deadly Silence. The 2006 Nintendo DS title was a port of the original version of the PS1 game, although it restored the auto-aiming and also added the useful 180-degree turn. It also included a different optional arranged mode that made use of DS features like the microphone and touch controls. Playing Deadly Silence, it struck me just how substantial the GameCube remake really had been. Far from being a side project assigned to a B-team, it was developed by Mikami and Capcom as the next major Resident Evil project. Puzzles were tinkered with, the plot was fleshed out a bit and given a more serious tone, and all the graphics were redone from the ground up to transform a very dated PS1 title into one of the best-looking games on the GameCube (or the Wii, for that matter). Truly, it set the gold standard for video game remakes. Just as amazing, however, was the realization that the fundamental experience was already there in those primitive 32-bit graphics. The better production values made the GameCube version that much more immersive, but pretty much everything I've said applies equally to the original game. The classic game also had unique charms, such as the laughably horrendous voice acting and dialogue, and even a no-budget live-action opening sequence to complete the B-movie feel. I got about an hour into the GameCube version, before giving up. It was too early for me to be frustrated with the controls, the scarcity of ammo, and the fetch-quest-like puzzles. No, the game simply scared the pants off of me. I just got to the point where I could no longer will myself to open that next door, or turn that next corner. Still the scariest game I've ever played. Now, if it had been two-man . . . In its way, Metroid Prime was also a scary game, because of tone and the feeling of constantly being in danger. But because it was more action-oriented, I managed to rise to the physical and emotional challenge. After playing Resident Evil 5, can the series still go back to its roots? "After playing Resident Evil 5, can the series still go back to its roots?" The old games were and remain good, but I think that model may be tapped out. Future games would do better to follow the philosophy than the mechanics. Whatever anyone say, there will be no other Resident Evil's like Resident Evil 4.. That was the best part of all the games. Period. Although passed several years there have been nothing new on the latest Resident Evil 7 Biohazard. I've read on http://www.residentevil7news.com/resident-evil-7-biohazard about Resident Evil 7 game, the latest one part of the franchise. It is sad that his one is the last. There will be no more releases of this game.